The Bird is an electric cargo / delivery scooter from the well known Chinese electric scooter manufacturer Sunra. The company sells it’s scooters in over 70 countries and has a production capacity of 4 million electric scooters per year. 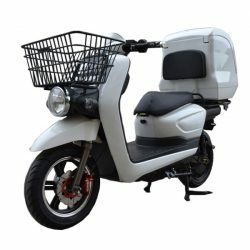 The scooter has a high quality 2000 watt Bosch electric motor and can be ordered with two battery options: 1x 20 Ah for a range of 50 km and 2x 20 Ah for a range of 100 km. The scooter has a cargo capacity of 150 kg (excluding driver) and can climb hills up to 15 degrees. The maximum speed without a restriction is 70 km/h. The scooter is available in many color combinations and can be customized with advertising.